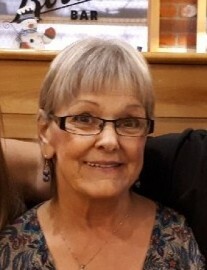 It is with a great sense of loss that the family of Mary Elizabeth (Keleher) Drane, loving partner of Clayton Smith, announces her passing which occurred on Saturday, February 9th, 2019. Born in Saint John, Mary was the daughter of the late Frank and Virginia (Bennett) Keleher. A genuine and loving lady, Mary was always proud of her ability to be there for others. She shared a love for cooking and was proud to spend her working career doing just that with the Sisters of Charity and later Rocmaura Nursing Home until her retirement. Mary enjoyed being around people, socializing and playing BINGO. Above all, she was extremely devoted to her family. Along with Clayton, left to mourn is her cherished son Stephen (Crista Olsen), brothers; Gary, Randy and Bobby, sisters; Connie Richard, Cindy (Bobby) Keleher, Doreen (Tim) Keleher and Peggy Keleher. She will be forever missed by her grandchildren; Alicia Soucy, Callie Drane, Katelyn Flynn and Jack Flynn. In addition to her parents, Mary is predeceased by her brothers Frankie and Terry, sister Linda King as well as her beloved canine companion Casper. Resting at the Fundy Funeral Home, 230 Westmorland (646-2424) with visitation hours being held on Tuesday, February 12, 2019 between the hours of 2-4 and 6-8 pm. Funeral Liturgy will be held on Wednesday, February 13 at 2:00 PM from the Fundy Funeral Home Chapel. To know Mary, was to love Mary. She will be fondly remembered by friends and family for her loyalty, kindness, honesty and sense of humour.